Copenhagenize.com - Bicycle Urbanism by Design: Islands Brygge - Application of the "Desire lines"
Islands Brygge - Application of the "Desire lines"
By applying the Copenhagenize Design Company concept of “Desire Lines” to an urban space, we were able to observe behaviours of cyclists, as shown in our latest research about the Bicycle Choreography of an Urban Intersection. 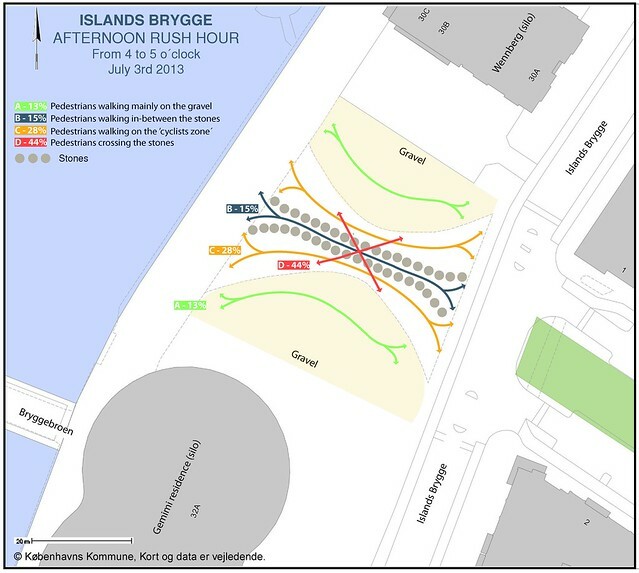 We used the idea of "Desire Lines" to observe cyclists at Islands Brygge moving through a space shared with pedestrians, and we assessed the ways in which geography impacted movement. 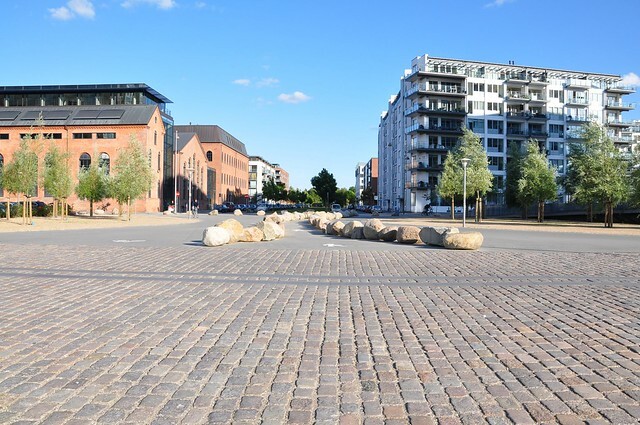 Recently, the municipality decided to divide this space by placing stones in the middle of it, with the intention of using the stones to channel the flow of cyclists. When looking at this new layout, we immediately noticed that this remodelling did not respect instinctive human desires. Our philosophy suggests that infrastructure should cater to the desires of cyclists and pedestrians as much as possible. 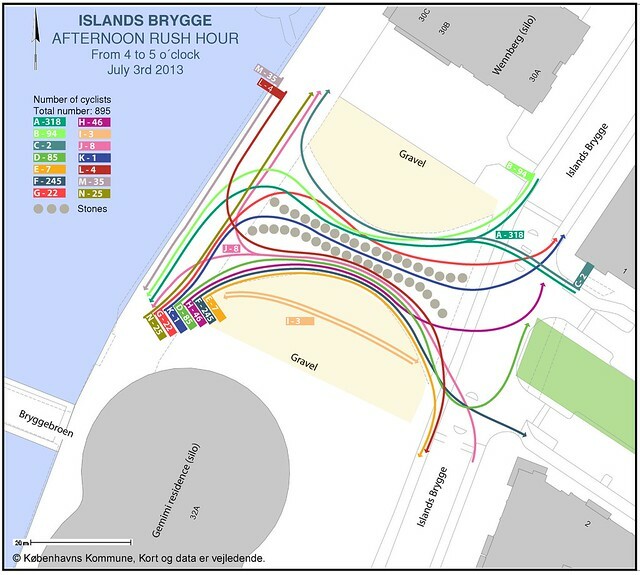 The following illustrates what we observed in Islands Brygge, close to Bryggebroen - the cyclist/pedestrian bridge which is being used everyday by thousands of people. Here is a quick analysis that demonstrates the ways in which "Desire Lines" can be applied in order to better understand public space. 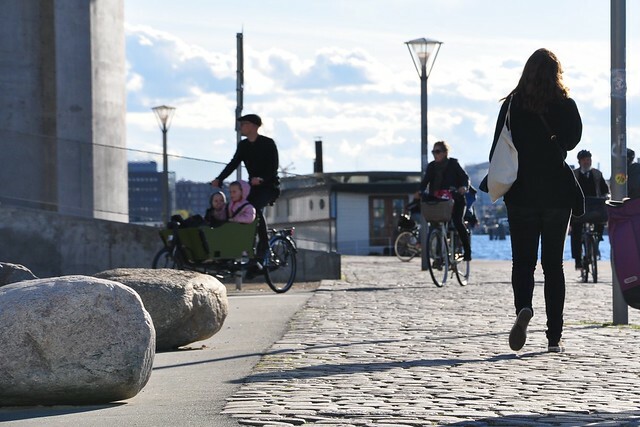 Approximately 8.000 bicycles cross Bryggebroen every day, as it is one of the best short-cuts joining the southern districts of Copenhagen. The elevated bike track called "the Bicycle Snake - Cykelslangen” will be launched in the near future, and the Municipality expects that its opening will encourage at least twice as many bikes to cross the bridge each day. Cyclists will join Dybbølsbro without carrying their bike down the stairs. What a relief! Although Bryggebroen is a fantastic example of bicycle infrastructure, the spatial layout on either side of it does not effectively cater to the needs of cyclists and pedestrians when they continue their journeys after they have crossed the bridge. So far, the number of users creates a comfortable flow, and ensures safe interactions between cyclists and pedestrians. However, with the rising of cyclists using the bridge, this shared space will see a more complicated relationship between those who travel by foot and by bike. It is likely that the use of stones was an attempt to organise pedestrian and bicycle traffic. 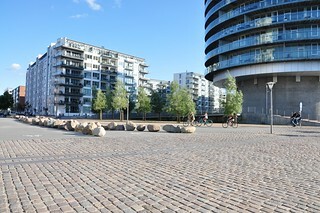 The Municipality first placed stones in between the Gemini Residence and the Wennberg Silo in June. The stones were put in the middle of the shared space between cyclists and pedestrians in order to channel the different flows. Anticipating an increased flow was the right approach, but placing stones in the middle of a bike path is clearly not the ideal solution. Does this solution deliver the right results? 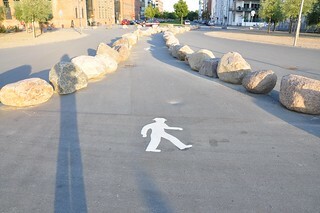 These stones force cyclists who are coming from the right side of the bike path and heading to the left, to perform a wide bend on the right before turning left. This means that cyclists are redirected away from their desired path, and are pulled in the opposite direction. As for the pedestrians, they are invited to walk only in-between the stones. This is a strange way to divide the spaces allocated to each group. At first sight, it seems unnatural for a cyclist not to take the shorter way. That's why Copenhagenize Design Co. has decided to apply its « Desire Lines » tool to this shared space in order to analyze the behavior of cyclists and the pedestrians. We observed the space for two hours during a single day (one hour in the morning rush hour, and one in the afternoon rush hour) on July the 3rd. To cross this space, the cyclists followed no less than 14 different trajectories. Here are the results. Looking at the cyclists' behavior, 14 different lines were observed: 11 in the morning, when most cyclists were heading to work, and 14 in the afternoon, including some very unique desire lines. - from 4 to 5 o'clock: 835 cyclists going through the public space + 60 cycling along the water. A cyclist generally chooses his or her route in a way that guarantees the shortest distance. For instance, 77% take a bend as short as possible when they turn (line A). The ones who take a large bend, do it in order to avoid a pedestrian, or a cyclist coming in the opposite direction. A few cyclists do it without specific reason. - The pedestrians crossing the stones and walking both in the pedestrian and cyclist zones – line D.
- 8% (morning) and 13% (afternoon) walked on the gravel - line A. To sump up, the new layout does not fit the pedestrians' behavior. The flows are not completely divided and the pedestrians and cyclists keep on sharing the space. The majority of the pedestrians weave through the stones, which is quite a nuisance for them. Moreover, there is no crosswalk in the continuity of the pedestrian area. To conclude, this remodeling of the public space around Bryggebroen does not follow the basic behavior of the cyclists and does not bring obvious and relevant solutions for the pedestrians. That's why we would like to present a number of suggestions for a new layout. 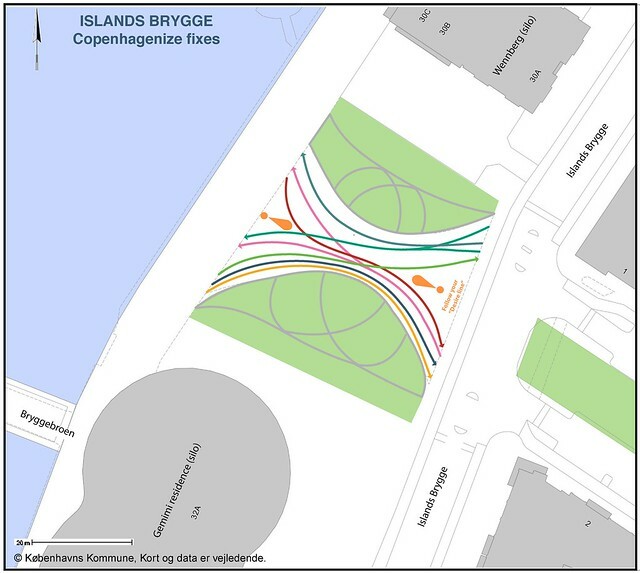 To follow up on our analysis about Bryggebroen, we've come up with a number of solutions that will help reorganise the surrounding space according to cyclist's Desire Lines. Here's how. First of all, we suggest that the stones be removed as they represent a risk in the case that cyclists fall. Secondly, it is necessary to organise the space by re-painting the ground to indicate the different cycling flows. Thirdly, we advise that the area can be improved by upgrading the gravel areas to create pedestrian-friendly spaces. In a similar fashion to Copenhagen's blue bike lanes, we think that paint can be a solution to channel the flows, giving more freedom to the cyclists and pedestrians when it comes to the trajectories they want to follow. Most importantly, we just think that creating urban art based on Desire Lines would be fantastically cool. We would love to see it. Commuters need to understand that this space is not a bike track, yet is neither a sidewalk or a square. We already noticed that most of the cyclists naturally slow down when they ride on this shared-space, and then again when they reach the cobblestones. We suggest the creation of a “Human Zone” instead of an area divided by stones. Based on the desire lines observed, we suggest that the space can be reorganised through a series of colourful lines and arrows on the ground. The addition of a very low rubber border could help to define these lines for commuters. By removing the stones and drawing lines on the floor, we think that the number of desire lines can be reduced. Moreover, this layout can be considered as street art and can transform this place into one that is considerably more appealing. In order to channel the pedestrian flows on the edge of the space by limiting the number of pedestrians walking on the space shared with the bikes, we suggest that the gravelled area is transformed into a pedestrian-friendly space. This can be achieved by putting crossable paths that go in different directions, as well as benches.